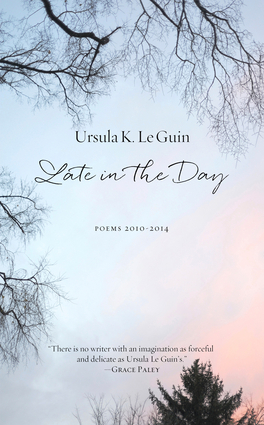 "There is no writer with an imagination as forceful and delicate as Ursula K. Le Guin's." —Grace Paley Late in the Day, Ursula K. Le Guin's new collection of poems (2010–2014) seeks meaning in an ever-connected world. In part evocative of Neruda's Odes to Common Things and Mary Oliver's poetic guides to the natural world, Le Guin's latest give voice to objects that may not speak a human language but communicate with us nevertheless through and about the seasonal rhythms of the earth, the minute and the vast, the ordinary and the mythological. As Le Guin herself states, "science explicates, poetry implicates." Accordingly, this immersive, tender collection implicates us (in the best sense) in a subjectivity of everyday objects and occurrences. Deceptively simple in form, the poems stand as an invitation both to dive deep and to step outside of ourselves and our common narratives. The poems are bookended with two short essays, "Deep in Admiration" and "Some Thoughts on Form, Free Form, Free Verse." Ursula K. Le Guin is a mentor to two generations of radical feminist and progressive writers. Her novels and stories have won every major science fiction and fantasy award as well as the Pen/Malamud and the National Book Award. Her works include The Dispossessed, The Left Hand of Darkness, and A Wizard of Earthsea. In 2014, she was awarded the Medal for Distinguished Contribution to American Letters by the National Book Foundation, a lifetime achievement award. She lives in Portland, Oregon.